There is no question that the Retail industry has been experiencing disruptive change. 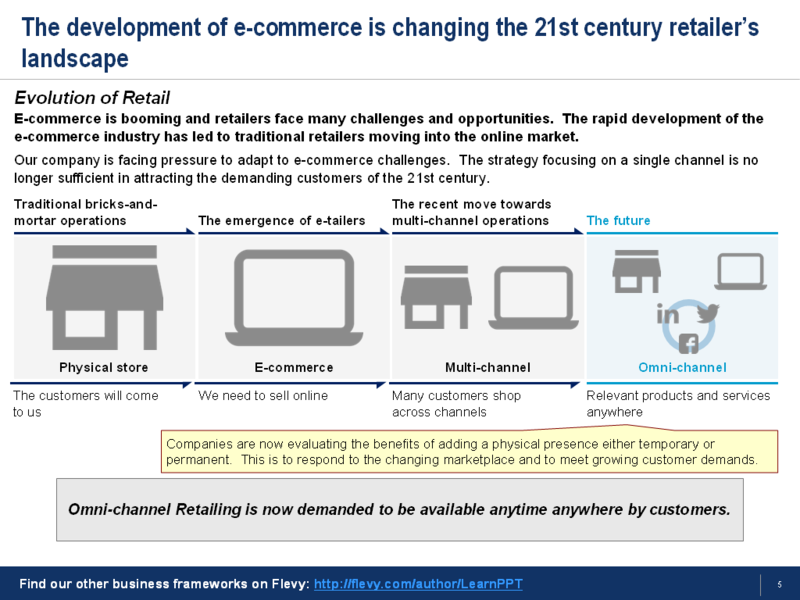 Traditional retailers can no longer survive in a Digital Age dominated by e-commerce. Even a traditional physical stores having an e-commerce presence is not enough, with the rapid growth of Mobile and Social Media. As technologies and accessibility continue to improve, the 21st century shopper has become more demanding than ever–they want to be able to shop anywhere, at anytime. 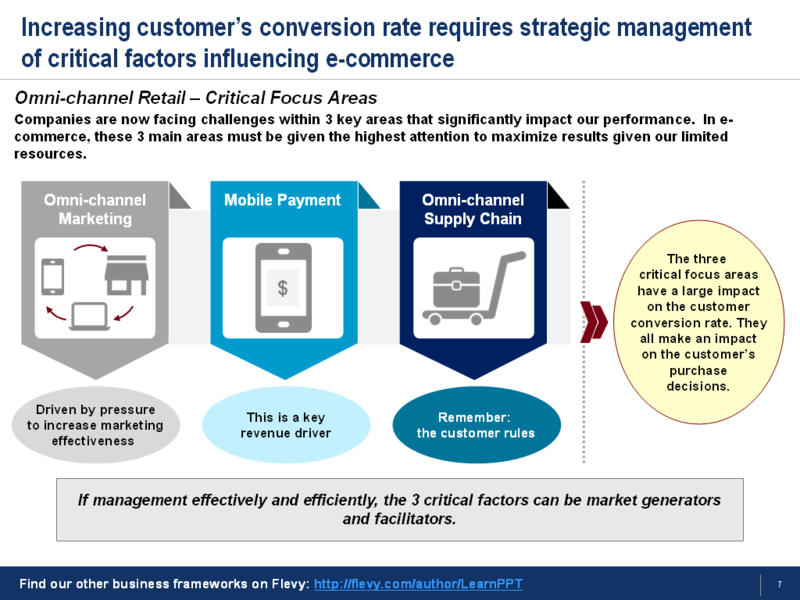 Furthermore, the shopping experience across disparate channels must be seamless. The diagram below illustrates the evolution of the retail experience. We are now entering the age of Omni-channel Retailing. Customers now demand information about stock levels, delivery times, and shipping options, regardless of where within the retailer’s network they are situation. The challenge is to find a seamless solution for both the Customer Experience and internal processes. This implies an integrated backend across the channels, particularly when it comes to customer data. Omni-channel Marketing changes the way we do business. It allows for a more interactive and personalized brand experience. 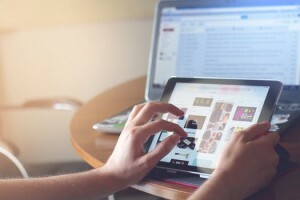 Omni-channel Marketing goes beyond siloed behavior. It reaches customers through all possible touch points and channels. It is important for our company to decide on a Marketing Strategy specific to our business and offerings. This is to make sure that marketing goes through the right channels for a specific customer group. Today, customers are spending more time on Social Media networks and the Internet. Traditional marketing, such as print and television commercials, is decreasing in favor of Online Marketing. SEO is considered organic marketing and consists of optimizing website content to achieve a higher ranking in search engine results by finding the right keywords. A good example to look at is Facebook. Facebook is the primary media, because it is easy to target specific customer groups through their advertising platform. SEA is a driving force for e-commerce organizations, this is purchased Online Marketing such as keywords, Google shop-ping and pay-per-click. These represent a cost effective way to reach new and existing customers with personalized content. These campaigns also represent among the highest in ROI. As a caveat, while the urge to try something new is encouraging, business must know which channel is most effective (i.e. best ROI) in reaching out the changing market. The explosion of the e-commerce market has resulted in significant development when it comes to online payment solutions. Multiple payment solutions have existed within the e-commerce market for awhile. Recently, mobile payment has been driving sales across the various channels. Online customers expect multiple payment options. They demand convenient and customer-oriented payment solutions that can process transactions securely. This challenges our company to offer the right mix of payment solutions. A number of innovative payment solutions have emerged in the marketplace. 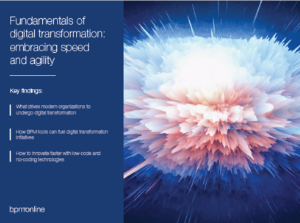 Enhancements in technologies, more user-friendly software, and a high smartphone penetration rate have overcome challenges regarding security, trust, and ease of use. Review our current spend on payment solutions and evaluate profitability of establishing our own invoicing solution. The Supply Chain is the backbone of e-commerce operations. Its design is of critical importance. After all, the setup and execution of the Supply Chain drives Customer Experience. Traditionally, Supply Chain Management (SCM) has been a key enabler to profitability and long term success. SCM can be defined as the management of the flow of goods of services, from the movement of the raw materials till the final product is received by end consumer. With the rise of the Omni-channel Supply Chain, there are more and more variations and thus complexity in how the final product is received by the consumer. 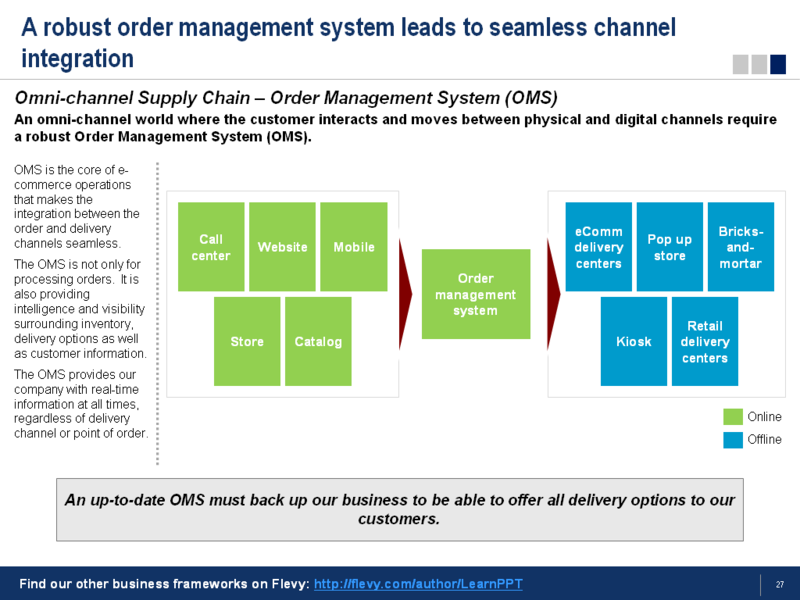 Omni-channel fulfillment must break down the barriers between the various channels to meet the increased complexity of orders across various channels. A well-functioning Supply Chain can achieve internal efficiencies, speed up deliveries, and reduce costs. Each of the Delivery and Return Strategies are distinctly different in terms of application and logistical requirement. 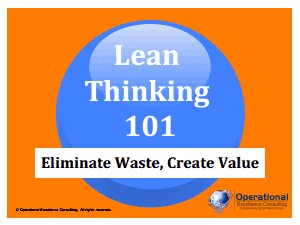 Our company must know which strategy can be operationally effective and optimal to our business model. Regardless what strategy our company takes, what is important is we get to drive excellent customer satisfaction. An up-to-date Order Management System (OMS) must back up our business to be able to offer all delivery options to our customers. See the visual below for a depiction of the core components of an OMS. Interested in gaining a more in-depth understanding on Omni-channel Retail Strategy? 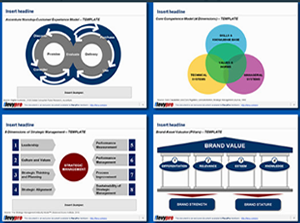 You can learn more and download an editable PowerPoint about Omni-channel Retail Strategy here on the Flevy documents marketplace. 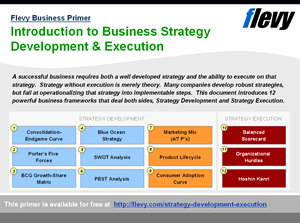 This presentation discusses these 3 focus areas in detail, including key trends, next steps, and relevant benchmarks.